The name “Viaduct House” is displayed prominently on the frontage of this building, but where is the viaduct? If you’ve just scanned the QR codes in the window of Little Poppets, look left and notice the crossroads where Heol Gouesnou descends to join The Struet. This is where the Neath & Brecon Railway crossed over The Struet on a viaduct of stone arches and steel spans. 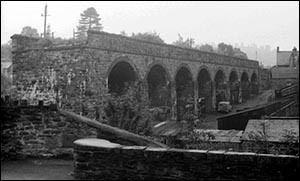 The photo of the partly dismantled viaduct in the 1960s, courtesy of the RCTS, was taken from Postern looking towards The Struet. The viaduct also crossed the river Honddu, which gives Brecon its Welsh name, Aberhonddu. Aber means mouth, and the Honddu flows into the Usk at Brecon. The Struet was recorded as Ystrywaid in the late 15th century and Struet in 1744. It runs from the former gate known as Strowed Gate (1698) to Priory Bridge and then parallel to the river Honddu. The meaning of Struet is uncertain but it may stand for ystrywaid, an otherwise unrecorded word meaning perhaps “a trap”, such as a fish trap. According to local historian Brynach Parri, Ystrywaid was the name of a district of Brecon where various industries clustered along the Honddu. He suggests the name may have denoted a place of craftsmen. Heol Gouesnou is named after the town with which Brecon has been twinned since 1988. Heol Gouesnou approximately follows the course of the railway from The Struet to the site of Brecon Free Street station (near today’s bus station). The viaduct was built for the Neath & Brecon Railway, which opened its line into Brecon in 1867. The much larger Midland Railway, based in Derby, effectively took over the railway in the 1870s to gain access to Swansea and its copper industry. As a child, Brynach Parri lived three doors from Viaduct House and the sound of the 7pm Neath train signalled bedtime! The driver and fireman would wave to the children as the steam engine crossed the viaduct. Brecon also had railways to Hereford and to Merthyr and Newport, but all three routes closed in the 1960s. In the early 20th century, printer and stationer WJ Knight occupied Viaduct House. In 1915 he opened a Labour Exchange, where unemployed people could register and employers could find workers. His eldest son was stores superintendent for the Brecon & Merthyr Railway.